Black Templars 101: Everything You Need to Know as a New BT Player! The point of this section is help fledgling Black Templars players decide what is the best course of action for their armies. These might be players who are coming back to the game after a long hiatus, new to the game, or they just might be starting another army and thinking about playing the BT. There will be quite a bit of information on these pages, and it's understandable if you don't get all of it right away. Its here for you to reference and learn from, but don't feel like you need to do it all at once! I've been playing the Black Templars since their release in 2001, so I've had a while to learn these things. It is my goal to help ease the learning curve and start laying the foundations for a successful run with the Black Templars. If you're interested, continue reading. Or visit my blog to see what else is going on. I also recommend that you read the Site Primer and the Acronym Guide before continuing on here with the BT 101 guide. Now that you've got the prerequisites out of the way, I want to be extremely clear about something. I do not consider myself the end-all, be-all on Black Templars. The advice listed in this guide is meant to teach and is not intended to cover every single nuisance of every single situation. Nor do I claim that the list in Building a 8th Edition List is an uber-competitive army. It is a template. Its the thought process behind building the list that matters: Balance, Duality, Repetition, and Redundancy. There could be any number of other competitive lists out there that I've not thought of for the Black Templars. There could also be situations or tactics that I've neglected to put in BT 101, or something written in the guide that you plain disagree with. That is fine. While I generally know what I'm talking about, I am not perfect, nor do I know of any player who is. I'm perfectly capable of making mistakes just like everyone else. The point is to help you become a better BT player, not to make a clone of myself. If you are more interested in competitive lists, go to Building a Competitive 8th Edition List or Building Another Competitive 8th Edition List for more advanced list building articles. Because this is a beginner's guide, some terms and explanations may be generalized without going too in depth. Part of this is so my readers don't have to read massive walls of text. Another reason is that I need topics of discussion for future updates. Leaving some vague explanations now gives me the opportunity to visit those topics at a later date, with a much more detailed articles. So if you have a question about something, or are confused by my reasoning and need more help, send me an email. 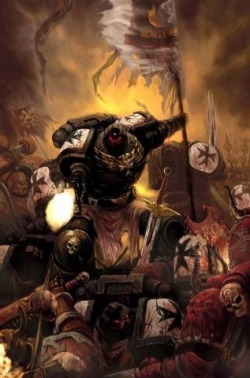 The Black Templars may not have its own faction codex anymore, but we've been given some level of uniqueness from our vanilla Space Marine brethren. Thus, we've become an army of finesse. We don't have the speed that the Blood Angels have, nor do we have the versatility of the Space Wolves. But that doesn't make us bad, quite the opposite in fact. So if you feel you want a characterful, knightly, and honorable Space Marine army, you've come to the right place. Only we have carried on the Emperor's dream of an united Universe. It is Humanity's Manifest Destiny. Join the Eternal Crusade, the Immortal Emperor demands it!